(c) 2010 Silverton Consulting, Inc. There have been a number of Microsoft ESRP submissions this past quarter, especially in the over 5K mailbox category and they now total 12 submissions in this category alone. The above chart is one or a series of charts from our recent StorInt(tm) dispatch on Exchange performance. This chart displays an Exchange email counterpart to last month’s SpecSFS 2008 CIFS ORT chart only this time depicting the Top 10 Exchange database read, write and log latencies (sorted by read latency). Except for the HP Smart Array (at #4) and Dell PowerVault MD1200 (#7), all the remaining submissions are FC attached subsystems. The HP Smart Array and Dell exceptions used SAS attached storage. For some reason the HP Smart Array had an almost immeasurable log write response time (<~0.1msec.) and a very respectable database read response time of 8.4msec. As log writes are essentially sequential, we would expect a SAS/JBOD to do well here. But the random database reads and writes seem indicative of a well tuned, caching (sub-)system, not a JBOD!? One secret to good Exchange 2010 JBOD performance appears to be matching your Exchange email database and log LUN size to disk drive size. This seems to be a significant difference between Dell’s SAS storage and HP’s SAS storage. For instance, both systems had 15Krpm SAS drives at ~600GB, but Dell’s LUN size was 13.4TB while HP’s database and log LUN size was 558GB. Database and log LUN size relative to disk size didn’t seem to significantly impact Exchange performance for FC subsystems. The other secret to good SAS Exchange 2010 performance is to stick with relatively small mailbox counts. Both the HP and Dell JBODs had the smallest mailbox counts of this category at 6K and 7.2K respectively. There appears to be little correlation between read and write latencies in this data. All of these results used Exchange database resiliency or DAGs, so they had similar types of database activity to contend with. Also the number of DAGs typically increased with higher mailbox counts but this wasn’t universal, e.g, the HDS AMS 2100 (#1) with 17.2K mailboxes had four DAGs while the last two IBM XIVs (#9&10) with 40K mailboxes had one each. But the number of database activity groups shouldn’t matter much to Exchange database latencies. On the other hand, the number of DAG copies may matter to Exchange write performance. It is unclear how DAG copy writes are measured/simulated in Jetstress, the program used to drive ESRP workloads. But, the number of database copies stood between two (#1,2,5,8&10) and three (#3,4,6,7&9) for all these submissions with no significant advantage for fewer copies. So that’s not the answer. I will make a stand here and say that high variability between read and write database latencies has something to do with storage (sub-)system caching effectiveness and Exchange 2010’s larger block sizes but it’s not clear from the available data. However, this could easily be an artifact of the limited data available. In our view, database read latencies correlates well with average Microsoft Exchange user experience for email read/search activities. Also, log write and database write times can be good substitutes for Exchange Server email send times. We like to think of database latencies as a end-user view of Exchange email performance. 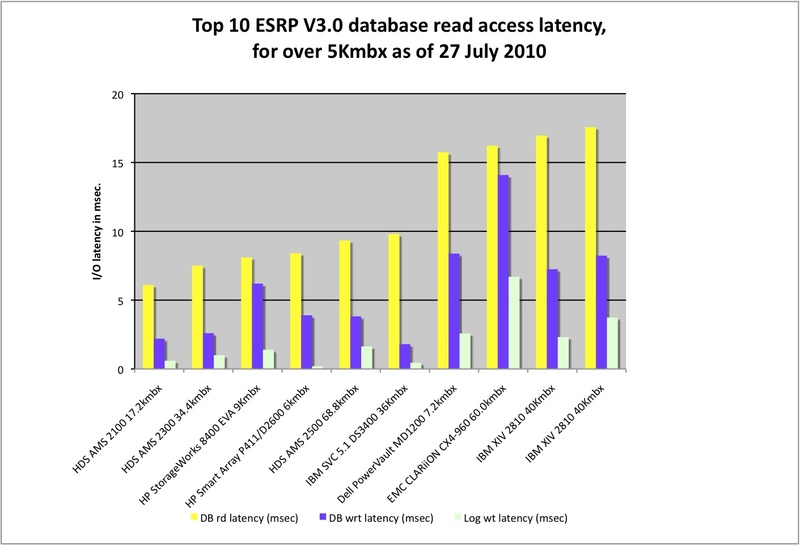 The full ESRP v3.0 performance report will go up on SCI’s website next month in our dispatches directory. However, if you are interested in receiving this sooner, just subscribe by email to our free newsletter and we will send you the current issue with download instructions for this and other reports. Exchange 2010 is just a year old now and everyone is still trying to figure out how to perform well within the new architecture, so I expect some significant revisions to this chart over time. Nonetheless, the current crop clearly indicates that there is a wide disparity in Exchange storage performance. As always, we welcome any constructive comments on how to improve our analysis of ESRP results. 1. Microsoft allows up to 20ms response times for reads with exchange 2010 (as well as 2007). So ESRPs respect that and limit it up to 20ms response times for reads. If a vendor chooses to use lower response times the price you pay here is TCO of course. 2. Exchange 2010 average block size is around 32KB-34KB, generally speaking the larger the block size the higher the response times. Compared to exchange 2007 with 1/4 size IO's around 8KB I actually think Microsoft so increase the limit to even more then 20ms. 3. If you measure impact of 20ms response time on an email read vs 10ms you will find that it's negligible compared to the transfer times over the IP network, the processing time on the clients etc. Response times for exchange 2010 following the ESRP guidelines should be less then 20ms, yes all vendors can aim to do lower then that, just put less mailboxes etc. But you lose on TCO and don't gain anything. In my opinion your metric of tracking response times is irrelevant if it's following the guidelines. I meant putting less mailboxes on the storage as a whole reduces the response times and that's very easy to test and show. Microsoft defines the 20ms limit, your argument is not with me but with them. I completely agree with MS that 20ms for 32KB-34KB large blocks with all the overhead of the network outside of the storage makes a lot more sense then 10ms. Anyway my point is that each vendor could have choose to go with less response time ESRP submission but that would be a waste of our (the customers) money since 20ms is sufficient for Exchange 2010 large blocks (heck, it was good enough for 8K on exchange 2007). Last, the Jetstress testing is assuming 100% mailboxes producing 100% of their ALL the time. The reality is that mailboxes don't run at 100% of their iops demand all the time. Hence the table above shows the worse case scenario on a real production exchange 2010. And if the worse case scenario is that you are getting close to 20ms on your peaks then any customer should be fine with it! You think that EMC or IBM could not have done 10ms ?!? you are wrong my friend. they just choose to be better on TCO and not waste their customers money. So they put more mailboxes bigger in size used more capacity to drive better TCO still at the limits of MS.
You provide no argument why latency is important here. You ignore my comments above that ESRP is testing all mailboxes running at max iops as worse case. You ignore the TCO that I mention. Really what is the base of your claim here? MS did great changes in the IO stack to allow larger and even slower drives yet you and others keep pushing faster drives ignoring the changes and recommendation MS has without giving any real justification for it and by that having customers buying smaller faster drives with low tco. it's such and easy stand to say the fastest response time is the best for customers, if you would do a real study and check the impact I would love to see it. Because MS did and published their recommendations on their website and they produced a very good calculator that demonstrate it. Examples of tco and why customers should not listen to this claim of faster response times, I will pick two ESRPs right from MS website. HDS did 68,000 mailboxes of 1GB with 0.12iops per mailbox, that's 8160 iops in total against the storage. They did it with 480 15K 450GB drives. XIV (1tb system) did 40,000 mailboxes of 1GB with 1iops per mailbox, thats 40,000 iops in total against the storage. They did it with 360 7.2K 1TB drives. Any none storage person can clearly see that the later did much more with much less! That's what I'm talking about saving money to customers. That's the real deal here! I encourage you to do a deeper sdive here you are missing the point of this new technology and misleading customers to look at the wrong matrices and spend their money old old approach of speeds and feeds. You have a mistake wit your numbers above. Please re examine the ESRP. The submission of IBM tested one XIV at 20,000 mailboxes at 1iops. Don't confuse the 2TB ESRP. I was talking about the 1TB ESRP. MS allows you to test a building block hence approved that ESRP. Emc and others did the same thing. If you check appendix of each ESRP you will find that in practice many of the ESRP did higher number of iops but reported to be safe little less. The same with the IBM XIV one. So check again your data since you provide incorrect results in Your answer above. You have to understand that MS approves those results. So one can't say they can do 40,000 mailboxes at 1iops and not do you like you claim below! MS will not approve it. So please check your data and correct your answer. I would send you screenshoots but can attach here. I owe you the website but I'm the road today. I see how you got the mistake. the ESRP for IBM run 180 drives to generate 20,000 mailboxes and then use two XIV's (360 drives) for multisite DAG. So your numbers are half of what they should be at best. The appendix on the submitted paper is for one XIV tested 180 drives only. Which means in practice it did more then 40,000 iops for 40,000 mailboxes with 1 IOPS per mailbox. Do you see your mistake now? When submitting ESRP with DAG you don't have to test the entire setup. Jetstress allows you to test half of the DAG while simulating the IOs as if it was a whole setup. If you walk through the screens of Jetstress you will see this option to test multiple copies of databases. As such IBM submitted a 180 drive 20,000 mailboxes using this option. The ESRP is for 40,000 mailboxes showing half of the hardware tested and simulated the multiple copies using Jetstress option. The bottom line the ESRP is for 40,000 mailboxes with 2 XIV's and 4 Servers. The test was on 1 XIV and two servers at 20,000 iops (10,000 per server). This is approved ESRP from Microsoft! so let's not forget that. You keep saying your view still holds and you disagree yet you continue not to provide any real justification. Again to summarize. The IBM ESRP is for 40,000 mailboxes 1 IOPS per mailbox 1GB per mailbox. The test was for half of the setup and approved by MS. Jetstress has the option to do such test, MS wrote it that way to help vendors with smaller setups proving the solution including all it's ios. Please re-read the ESRPs, IBM is not the only one who did that. EMC did the same. You are twisting the math again. Why can't you see that!? It's very very simple. I give up educating you since you are not seeing the results as they are advertised or at least not understanding them. This is my last reply. And judging by the thumbs up/down on the replies I think people who read this article figured long ago that you are simply lacking an understanding how jetstress tests work in 2010 DAG env. I do owe you the link. I will get it tomorrow. Sorry for the delay there. IO Reductions: Exchange 2010 delivers up to a 50% reduction in disk IO from Exchange 2007 levels. This means that more disks meet the minimum performance required to run Exchange, driving down storage costs. Optimizations for SATA Disks: IO patterns are optimized so that disk writes do not come in bursts. This removes a barrier that had previously limited the use of Serial Advanced Technology Attachment (SATA) desktop class hard disk drives disks. Now you are just lacking on the understand of how SATA drive works and their speed. A transaction time on a good sata drive is a min 8ms response times! If you start running more then one transaction against a sata drive you get to 12-15ms etc. I suggest you look at some drives spec.. I give up. At least your readers are voting for the truth and not for your article. AMS advertised 68,000 maulboxes with 480 drives at 0.12 IOPS per mailbox thats 8160 IOPS against the storage. Thats the only math I see. This is what they tested, this is what they wanted to advertise so this is what we should judge them on. The bottom line IBM XIV did X4.9 more IOPS against the storage (40,000 vs 8160). AMS did not put all the servers outputs in the PDF. Instead they only put one server as example. So you do not multiple it by two here! It's 13,246 for ALL their hosts! IBM put in the document output from four servers showing 20,000 iops and the number of overall servers is eight so you do multiple it by two! IBM did over all against the storage 40,000 iops. AMS did against the storage 13,246 iops. That's 4x more iops with less drives on IBM compares to AMS. I hope it's clear now! AMS ESRP table 12,13,14 clearly says number of drives TESTED is 480. Also clearly stays right after that it achieved 13,246 iops. They tested with all the 480 disks! IBM tested only 180 disks and achieved 20555 iops. Clearly the IBM did significantly better. Interesting thread guys. But why are the storage systems ranked by I/O latency when they all exceed Microsoft's recommendation? I want to see the disk vendors ranked by mailbox density, footprint, and TCO. We're not interested in latency arms races. And this is why we don't hire techie storage consultants. Clearly MS dont care about that. They are not selling you the storage. That's why people like you (Ray) have a job! To help customers understand those results and what it means. Surely the only two important metrics are happy users and lowest TCO. Will real users detect these small differences in latency; I doubt it. Once you are belwo the Microsoft recommended limits you will have happy users. Will management notice differences in TCO – yes of course they will. I'm a bit shock to hear that you think email users will detect differences in latency between 10 and 20ms. Email users are demanding users, yes. But not to the point to hold you accountable for SLAs between 10ms and 20ms per IO. That, in my humble opinion is a bit a of a stretch. I also doubt that a customer will pay for a solution that will guarantee sub-10ms latency with configurations that will most likely be expensive in over all TCO. While latency is a pretty good first order metric to use as a proxy for user experience of the performance of the systems, there were so many other variables that were significantly different between the systems (cost, number of spindles, mailbox sizes etc), that just comparing latency alone has limited utility. In my past analyses of ESRP (and other) results, metrics like $/IOP, IOPS/Spindle and RAW capacity vs user Data ratios are all good metrics to have as these will be reflected in datacenter resource consumption which is a large concern for most. It also allows a more "like for like" comparison, though even that's not perfect. If two systems have similar IOPS/spindle then comparing the latency is a good indication of how hard they were pushing the disks/systtem and whether there is any headroom left to handle unusual spikes in the workloads. It might be interesting to come up with a weighting system where these are all pulled together for an overall "score", you could debate whether the weighting was appropriate but if you published all the data, you could adjust the wieghting factors to match your requirements/concerns and re-score the comparisons. That could be very useful.